One week to go until the 2017 Heps Cross Country Championships return to Van Cortlandt Park in the Bronx. Most of the squads will be resting up between now and next Friday as select harriers from Cornell, Dartmouth, and Yale will be racing either at the Reif Memorial in Ithaca, NY or the Central Connecticut State University Mini-Meet in New Britain, CT this weekend. But something to perk up your weekend – rankings, both of the regional and national kind, and some Kola Calculator predictions on who will make it to NCAAs in Louisville, KY in November. 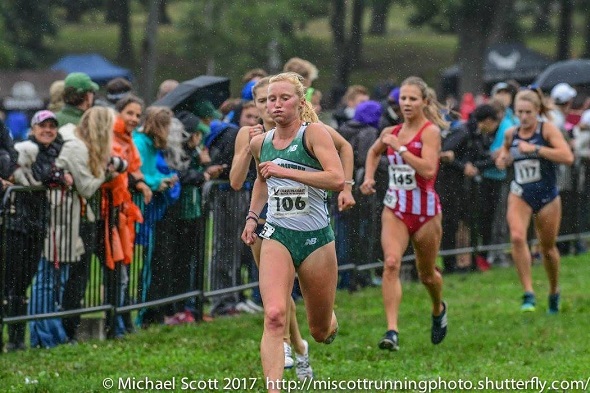 The Columbia women and Dartmouth women both broke into the top-30 for the first time this season and are currently ranked #2 and #3, respectively, in the Northeast Region. The Lady Lions sit at #24 nationally, their highest ranking since Week 4 of the 2012 season and highest ranking since Dan Ireland became Director of the Columbia programs. The Big Green are ranked #30 this week, their first numerical ranking since Week 2 of the 2015 season. Per the Kola Calculator, Columbia is likely to earn an automatic berth to the NCAA Championships, but Dartmouth currently doesn’t have enough points yet to earn an at-large berth. The Princeton women are also sitting #3 in their Mid-Atlantic region and receiving votes in the national poll after a strong showing at the PSU National Open last weekend. If they want to make it to the big dance, they will need strong showings both at HepsXC AND Regionals. A top two finish at the Mid-Atlantic regional meet is a TALL order as they will need to contend with nationally ranked #9 Penn State and #15 Villanova – teams who beat them at the National Open last weekend. Over with the men’s polls, we no longer have any teams with a national ranking. Instead, we have two squads who are receiving votes – Penn and Princeton. These teams are sitting at #2 and #3, respectively, in the Mid-Atlantic Region currently. The Kolas Calculator currently only predicts Penn making the NCAA cut due to their current #2 regional ranking. Meanwhile, Columbia is no longer nationally ranked after a sub-par showing at the Nuttycombe Wisconsin Invitational last weekend. The Lions – previously was #2 in the Northeast for the last three weeks – are now #3 and, per Kolas, out of contention for NCAAs based on the current numbers. The next poll releases will be on October 30th and we could expect some significant shifts in both national and regional polls once all of the conference championship meets are finished. Feel free to join the Heps Fans discussion on Letsrun.com and stay tuned next week as we transition into HepsWeek mode. This entry was posted on Friday, October 20th, 2017 at 8:14 am. It is filed under Athletes, Featured, Spotlight. You can follow any responses to this entry through the RSS 2.0 feed.